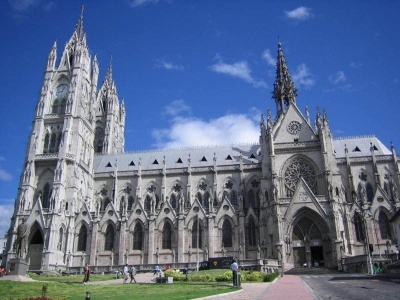 Also known as Cathedral Consagración de Jesús or Basílica de San Juan, the basilica in Ecuador's capital Quito is the largest neo-Gothic basilica in America. The first stone was grounded on July 10, 1892. Nearly a hundred years later, in 1988 the building was consecrated. It stands 30 metres tall, with spires up to 115 metres. It is possible to climb to the top of the spires and enjoy a view of almost the entire surrounding city, all the way to the mountains. It also has a sanctuary open to the public. It has 14 bronze statues, imaging 11 apostles and three evangelists. In the crypt the remains of several heads of the state are resting. The Galàpagos Islands is an archipelago of volcanic islands off the west coast of Ecuador. There are thirteen main islands, and three smaller ones. There are also a lit of rocks and islets. There are airports on two of the islands, but the others can be reached with boat. 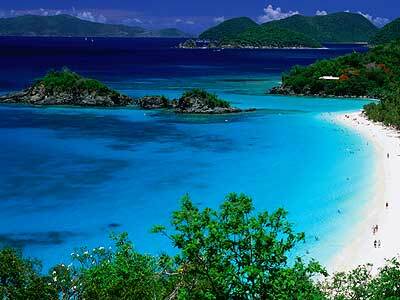 The islands are on the equator, so it is warm there, and they have many beautiful beaches. There are about 25 000 people living there The islands has many endemic species. This is where Charles Darwin developed his theory of evolution. Although the islands are a popular tourist attraction, there are heavy restrictions on tourism because It is unknown what impact it may have on the flora and fauna. TeleferiQu is one of the worlds highest gondolas. It goes from the edge of Quito at a height of 3 117 metres up to one of the peaks of Pichincha Volcano, known as El Ruco or 'Old Man', at a height of 3 945 metres. The ride takes about eight minutes. At the top there is a fantastic view of the city. There are many hiking trails to places where one can take wonderful pictures. When walking the trails, one should have a guide. The noise from the twin peak of the volcano La Gaugua, or 'Little Girl', can be heard once you step out of the cable car. She is still active. At the top there are also several shops and a restaurant. At the bottom of the lift there is an amusement park VulQuano Park, which is nice for the kids.